What services come with Momentum? What are the levels of service for Momentum? Why don’t I see SEO in your strategy? I don’t understand how everything works behind the scenes.. does this matter? How do you create industry specific content? Do you ever re-use content? How often will you post on our blog? How do industry blog articles differ from individual blog articles? 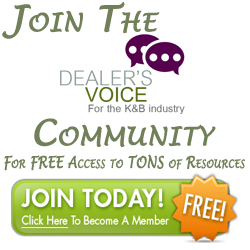 What is the Consumer’s Voice Resource Center’s role? How frequently should Email Nurturing be done? How does a consumer become a lead? Do I need someone at my dealership to handle leads from downloads? Can I have you do ‘warm calls’? How should our sales person address these downloads? What happens if you hand us a lead that didn’t end up buying? What do you do with regards to social media? Do I give up all social media rights when you take over? Will you respond to cleints for our company? What type of time commitment should I expect to be successful? Who will my point person for Momentum be? Momentum is a marketing solution designed for the Kitchen and Bath and Remodeling Industry. It is a solution to help you generate leads through your website, and position you as an industry leader. Momentum helps you grow leads in the Greenhouse phase of the consumer buying cycle. You are the educator helping the consumer understand how to buy a complex project. By educating early and often, you grow the consumer’s awareness and become the knowledge leader, often negating price sensitivity in the buying process. Momentum is about writing rich content that leads the Greenhouse consumer to give you permission to connect. We use blogging, higher value content such as guides and eBooks, landing pages, social media and email, so that a visitor to your site can become a suspect, then a lead and eventually a customer. There are three Momentum plans for you to choose from – Advanced, Professional, and Enterprise. Each level of service offers something different. All plans are outlined on our website, please click here to view them. SEO, or Search Engine Optimization, is not what it used to be. In the old days, it was all about spending countless hours on SEO by guessing and checking keywords and plugging them into every section of the website hoping that the search engines wouldn’t change their grading scales – again (they always do). Most search engines now de-list you for this type of repetition. Momentum’s method is more natural. The goal is to be found organically, which will happen as we write about topics that interest your readers. We’re always increasing find-ability through your content, but not jamming obvious, annoyingly placed keywords to the readers. No one wants to read “kitchen remodel [insert city name here]” in every other sentence. We don’t actively participate in paid forms of SEM such as paid advertising, because our goal is to make the lead generation process as inexpensive and effective as possible for our clients. According to Solve Media, you are more likely to survive a plane crash than to click on a banner ad. We believe in bringing a network of people interested in your products, and your company to you organically -rather than through old-school push marketing techniques (like banner ads). I don’t understand how everything works behind the scenes…does this matter? No, in fact, you shouldn’t worry about it. Let us take care of all the behind the scenes stuff! We write and live in the industry every day. There are many professionals on our team who have lived and breathed all aspects of buying and selling kitchens as well as remodeling projects. Not only do we see the consumer’s side of things, but we also have the dealer and manufacturer expertise close at hand. Match that with our team of creative writers, and when all the powers combine, beautiful content is born. No. Not only is this terrible for your rankings, its bad online manners. Even our summary industry articles are re-written and linked to all proper original sources. That all depends on the level of Momentum you choose. Each month, our Momentum clients will get what we call “industry” blog articles. These articles are shorter articles that still give the reader something to learn. They typically point to other websites or resources within our industry that prospects will find interesting (such as Houzz or the Consumer’s Voice). You’re welcome to send interesting links our way that you’d like to see featured on your blog. The Consumer’s Voice is the home for educational rich content that is available to homeowners or anyone seeking information on a home remodel. Our team is always working to add new helpful content to the resource center, which is also available for our Momentum clients’ use. As consumers download each resource, they tell us a little bit about themselves and their remodel plans. We triage them (look at the information they’ve willingly provided) and if they’re close to remodeling and are in the proper area, we send them to our Momentum clients. By joining the Consumer’s Voice community, you are plugging into an established network of contributors who are experienced in building and contracting, cabinet manufacturing, and sale and operations. The best part about that? It’s the kind of community consumers are seeking advice from when it’s time to remodel or buy a new kitchen. You can visit the Consumers Voice here. As new resources are made available on the Consumer’s Voice resource center, we immediately make them available to our Momentum clients. When leads download from the Consumer’s Voice resources, your email list naturally grows. With each new resource, we mock up an email for our Momentum clients to use as they please. We recommend sending the email to your lead list if you think the content will be beneficial to them (we can help you with this if you don’t have the resources to do so). It is not advantageous to exhaust your list by emailing them all the time, but we do recommend about once a month with new content they’ll find useful. There are many opportunities for people to become a lead when you spread your resources. Momentum leads usually come in through search engine searches, social media platforms, your blog, and resources on the Consumer’s Voice. While you don’t need to create a new position at your dealership, we do recommend you designate a point person who will contact leads that have downloaded resources. We would advise that this point-person be on your sales staff so that they can make the most of the lead. In our findings, leads tend to get annoyed if they’re passed from person to person on the phone, so the less contacts, the better. Enterprise customers do have the option to buy warm call nurturing. Please call your sales rep for more details. Your sales person should be aware of the content the lead has downloaded in case that lead has any questions. They should also know that these leads aren’t always expecting to be contacted. The nature of this call should be less salesy and more helpful. Make sure they received their download as expected and answer any questions they may have. This is a chance to get your foot in the door and find out more about their remodel through natural conversation. Remember, they willingly gave their phone contact and project information. As a part of your on boarding, we’ll speak with you about who should handle leads, what dialog should be used etc. This doesn’t mean the lead is dead. They’ll be on your growing email lists, and if they download again weeks later, we’ll notify you. When a lead does buy, we want to know. Often we can retrace the breadcrumbs that led them to become a customer, making it easier for other consumers that enter the process. Momentum is about continuous improvement; your feedback helps your community to grow. Professional and Enterprise clients get the opportunity to have us manage some social media accounts. We make sure that blogs and resources are made visible through social media platforms so that leads have the opportunities to discover you that way as well. If you don’t have accounts, we’ll create them for you. If you do, we’ll manage the existing accounts for you. Each month, we will work to grow your followers to expand your lead potential. Absolutely not. You will have as much access to your social media accounts as you want and are still welcome to (and encouraged to) post as frequently as you wish. In fact, it’s our jobs to make sure the content is available on your social media accounts but it’s still up to you to engage in conversations. Your customers and your audience want to hear from you, and if at any time you are unsure how to respond, we are here to help you! Will you respond to clients for our company? Some social media platforms encourage conversations with leads. In these circumstances, it is your responsibility to respond to the lead. We do not take over this portion because your responses show your expertise and are a part of your brand. No one can answer questions from your leads better than you can. If you have already started an online community and are educating consumers successfully, expect to spend six months expanding that community to see returns. If you are starting from scratch in the world of organic search and permission based marketing, expect a six month to one year commitment. Once your community is built and consumers go through the process, they will refer you to their friends since the whole process encouraged them to learn in a non-threatening way. You will have a dedicated account manager as well as a support team handling your individual account. Each review period, we send you a summary showing metrics related to website and blog performance from that particular period. There are so many metrics available, but not all of them are important, in fact the majority of people get caught up in metrics that don’t matter. We keep focus on the bigger picture. Marketing to your consumer is about engaging them while they are in the beginning stages of their remodeling process. We provide our clients with interesting and educational content and then make it available to consumers via multiple mediums. By doing this, we grab their attention, position you as their industry expert, and engage them to request more information from your business. At that point, you’ll receive a lead who has “raised their hand” that they are ready to remodel and to speak with YOU about pursuing their remodel.